One of our 2nd generation pure UK gilts had her first litter on March 15, 2019. RXF 212 Dahlia had a litter of 11 very early in the morning. This was her first litter and she was having some trouble and rolled on the first five. We are at day 2 now and she still has 7. 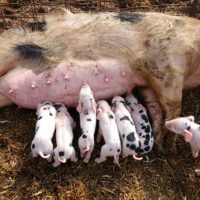 We will wean them on May 10, 2019 and will be offering them to GOSPBU club members for $450.00 with the purchase of a pure UK boar piglet. These are the rarest of the GOS lines and we need to build their numbers.